What is a Demi-Porteur bag? 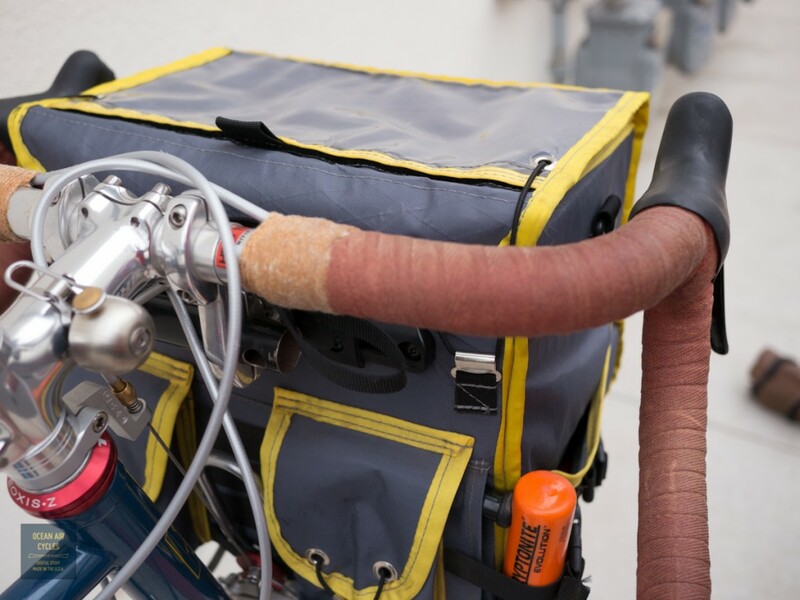 Ever since moving to a bike optimized for a front load I started to push the envelope of how much went in the upper bag vs. panniers. 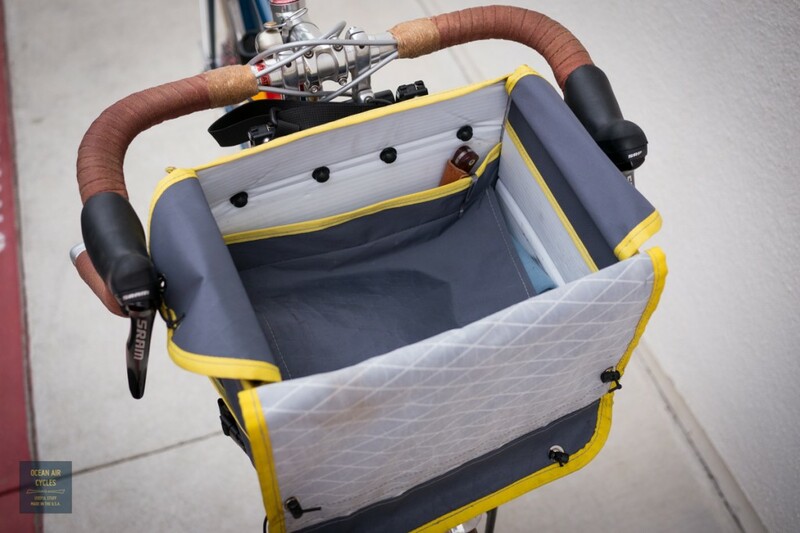 The goal being that the upper bag would accommodate 90% of my daily bike trasportational needs, and the panniers only come out for groceries, camping trips, etc. I keep a regular rotation of tools and clothing layers with me all the time. 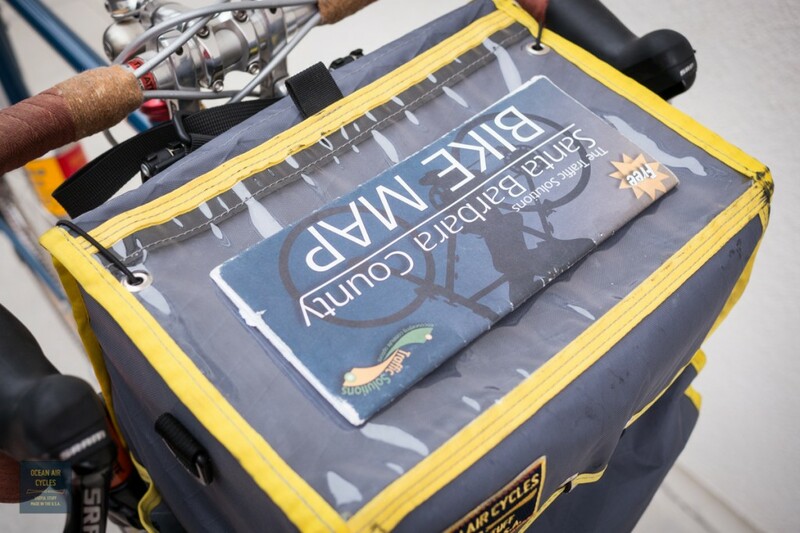 Add to that things that vary per ride like camera gear, meals, coffee gear, post office runs, etc. I needed maximum volume and flexibility. 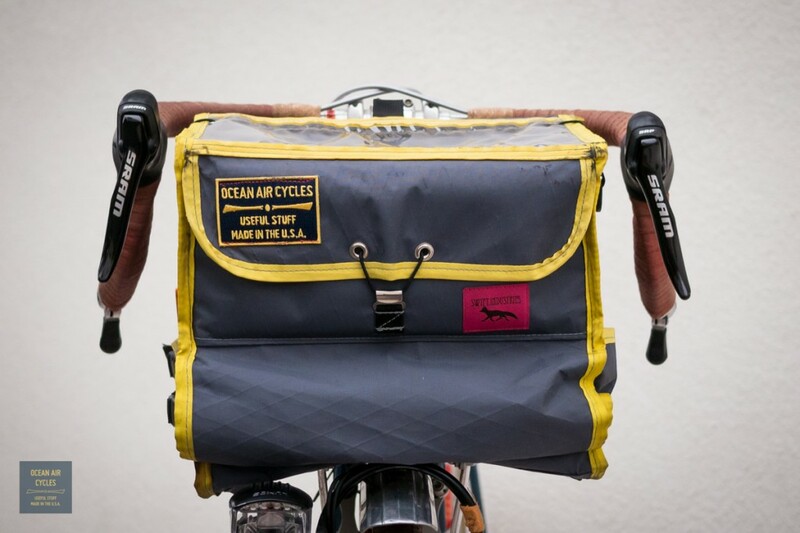 Starting with the basic form of a traditional randonneuring bag, I pushed some of the dimensions and features without going so far that it became a full porteur bag. While pushing the boundaries of size and volume I also wanted to shave some weight. The first place I made the weight cut was with material. The design is able to use all of the strong points of the Dimension Polyant XPac, and avoid most of the features that are considered the material’s downside. XPac is a three layer laminate, pack cloth on the outer faces, with a mylar center and a cross weave of polyester fiber on the bias for added load capacity and tear resistance. XPac does not like to be forced into compound curves or situation with high abrasion. The boxy shape takes care of the first. 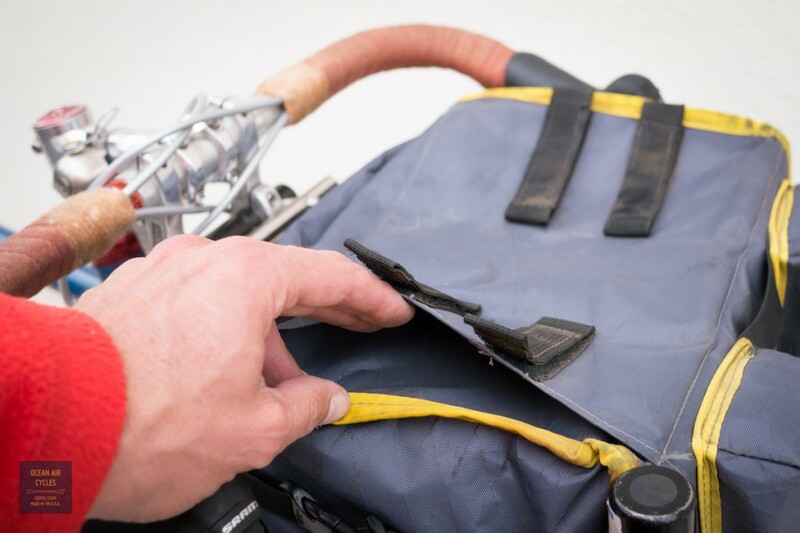 Abrasion is generally minor on the bag as it is surrounded by the bars and rack. The material is highly water proof and light for the amount of strength. By Rando Bag standards this is a huge bag. It is both tall and wide. Wide enough to fit 1 dozen eggs, and deep enough front to back to fit a second dozen as needed. Overall dimensions of the main compartment are 28cm tall x 21cm deep x 30 cm wide. 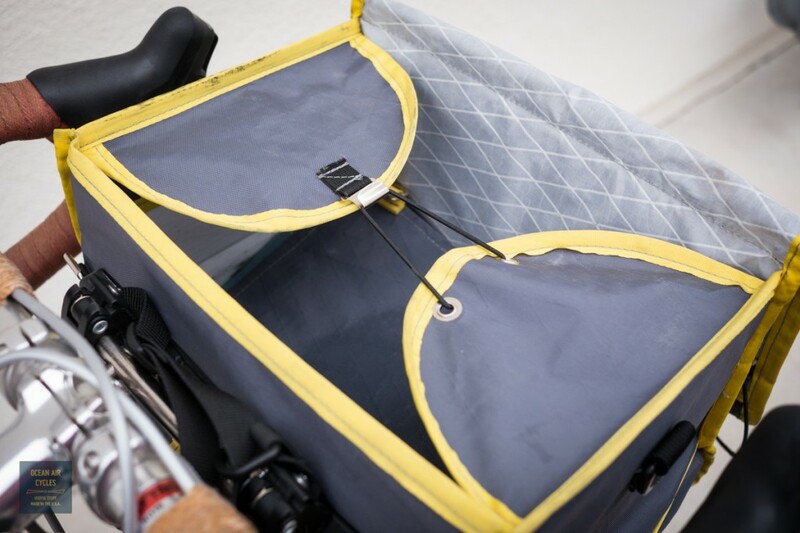 There is 37cm of space between the inside faces of my break hoods, while I do not have any problems with finger rub, I would not use the bag if yours are any narrower. 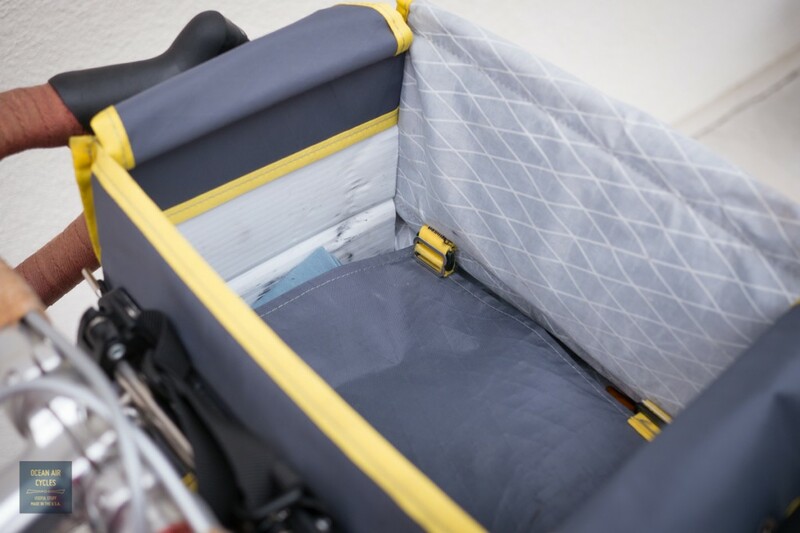 The main compartment has a removable partition to keep your loads separate. Tall bags can quickly become cluttered and challenging to get stuff off the bottom. The everyday stuff like pumps, warmers and wind breakers stays on the bottom, things I want regular access too is on the top; snacks, camera gear etc. This could easily split a change of work clothes on the bottom, lunch up top etc. 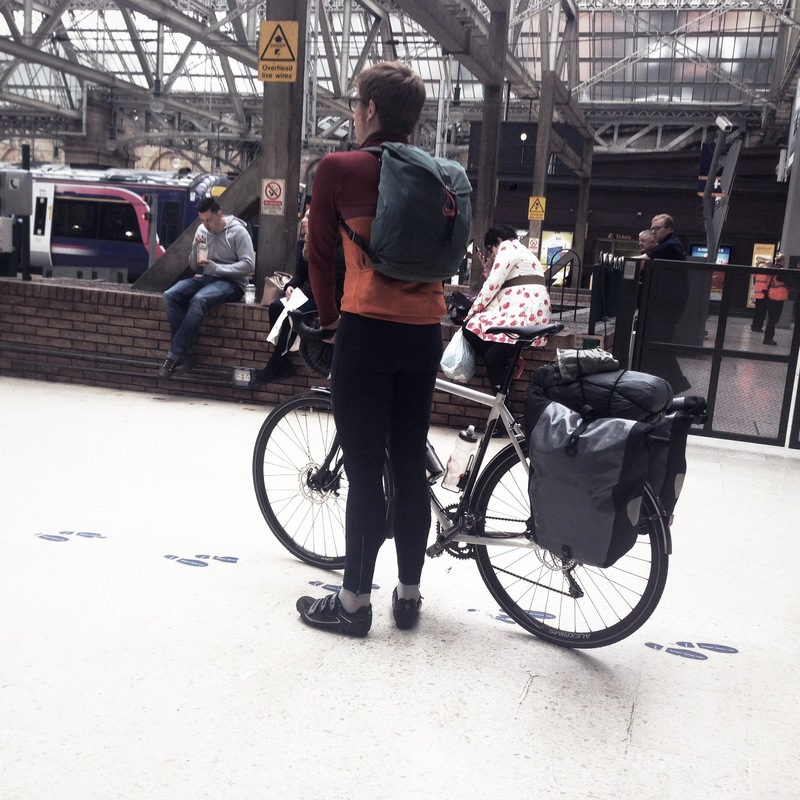 The partition can be removed much like an old hiking backpack to accommodate bigger items as needed. 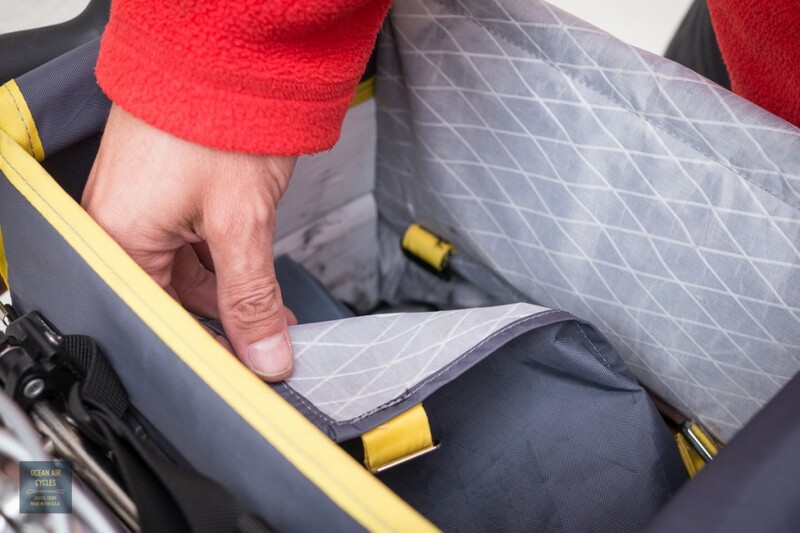 There is also a roll closure front for getting to the bottom load without having to enter through the top. .
Side pockets are standard rando bag style. 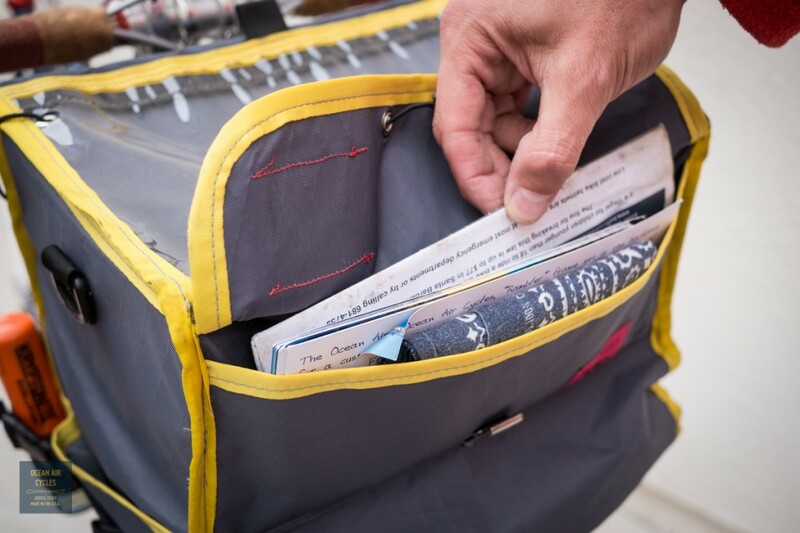 The front pocket is full width to fit all your odds and ends including full size road maps (AAA). The width caries over into the top map pocket, again easily accommodating full size maps and or your electronic device. Samsung Note 2 and meeting wallet shown for scale. the vinyl material on the top will also allow for the use of the device touch screen. The lid has two traditional inner flaps as well as top. The elastic closures have been moved from the center to corners. This allows for easier closure while riding. I generally leave one corner open for quick camera access. 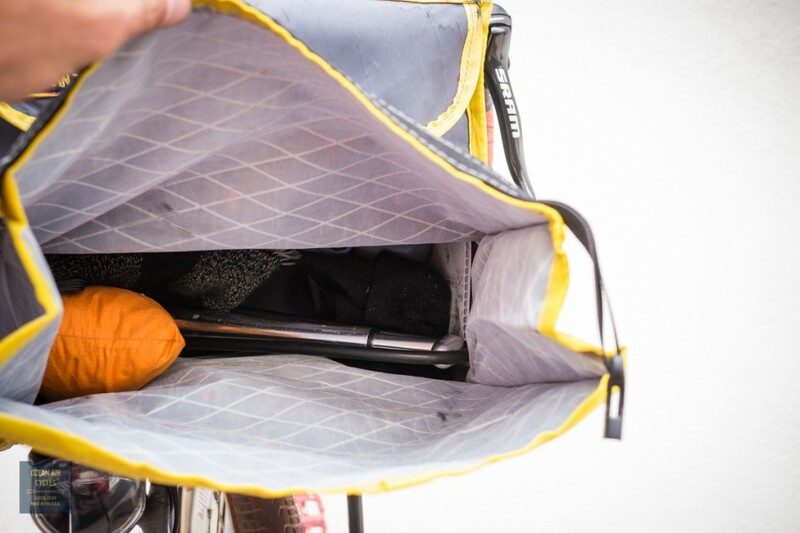 The rear facing part of the bag has two traditional small pockets. 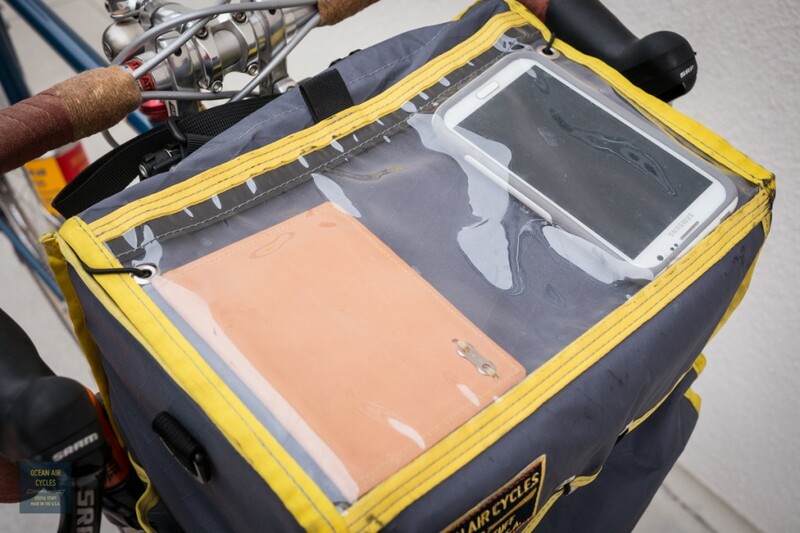 In addition there is an external lock pocket. 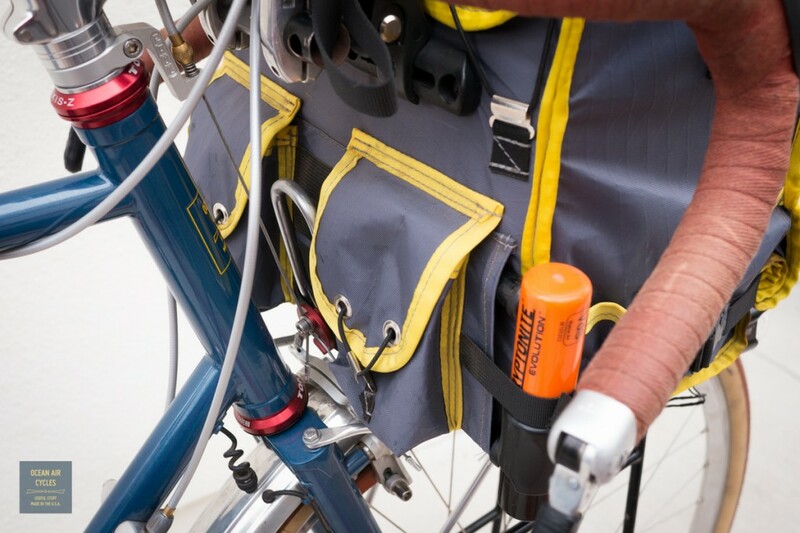 No more opening and unloading the bag to find your lock at the bottom. There are internal stiffeners on the three vertical sides. The bottom stiffener pocket is external. In general I have never felt the need for a stiffener there, but use it as a cutting board slot on longer trips. 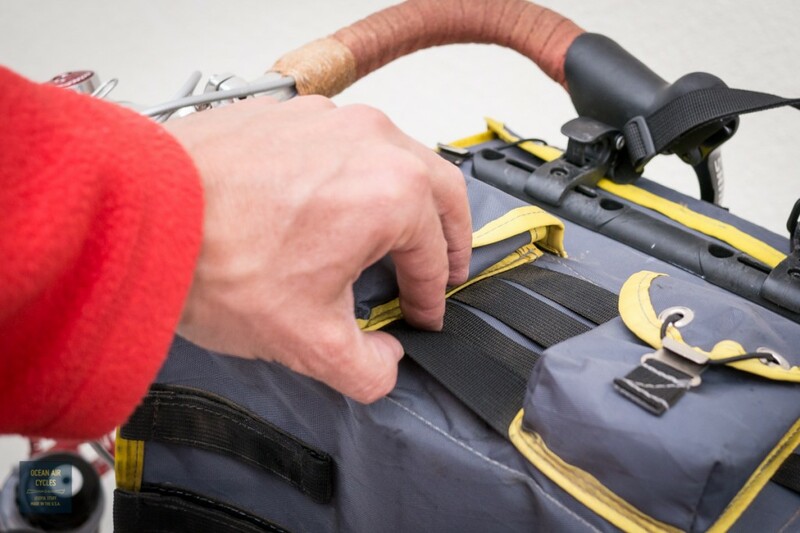 There are also the four traditional straps Swift uses to secure their bags to a min rack. I have only needed these for rougher roads. 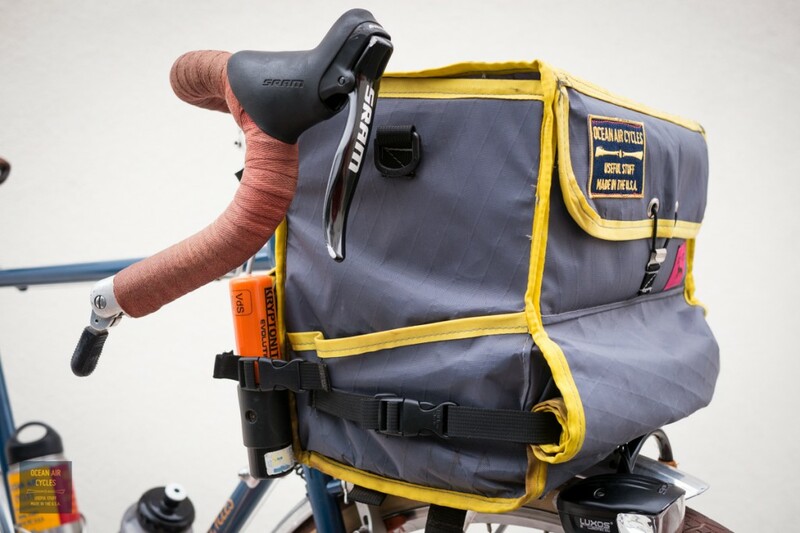 The bag can be secured to most traditional rando racks with the back stop strap and a decaleur system. Some type of upper support will be needed for a bag this size. Working out all of the options in this arena will be a separate post. 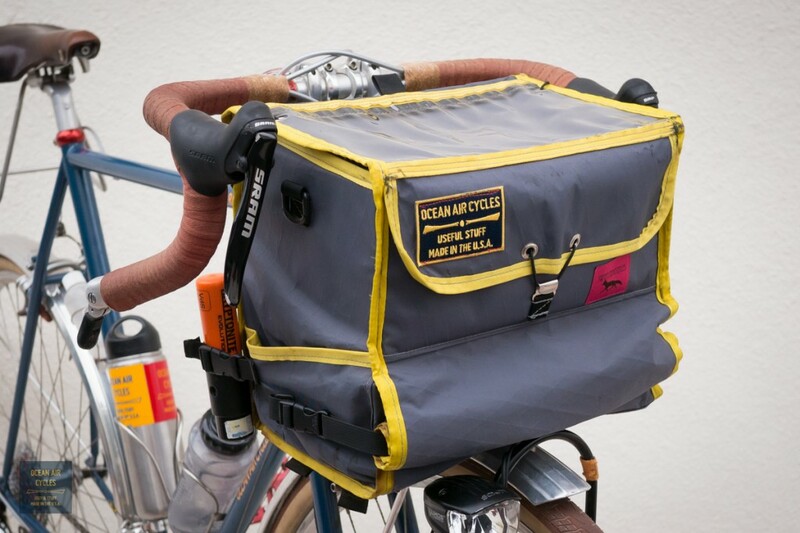 My current system of an Ortlieb pannier hook and hacked Nitto lamp mount has been fantastic. We are refining the design, but it is not yet ready for market. I may have skipped a couple of details, and there will be some subtle refinements as we move into production. That said the bag has exceeded all of my expectations, and is 98% perfect. Delivery time, final cost and total number made are still being worked out over the next week or so. Much of that will depend on initial interest. Stay tuned for a presale announcement, Newsletter subscribers will get fist crack at any discounts .